Wouldn't it be great if the sales process consisted of leads flooding into your funnel and begging to buy your product or service? Every sales meeting would consist of high fives and arrows skyrocketing off of revenue charts. Unfortunately, the buying process is typically much more convoluted, with plenty of additional steps, prospects with varying needs and constantly changing timelines and probabilities of closing. All of this is to say that most businesses will have to put in a considerable amount of time and energy to experience such a meeting. Luckily, we've put together some simple steps to create and manage a sales pipeline that will help you get there. A sales pipeline is a visual representation of your sales process consisting of the steps that you must take in order to sell to potential customers. Effective sales pipeline management will enable you to improve your sales process and develop more accurate sales forecasts. The steps outlined below will show you how to master the pipeline and increase your revenue. Qualification - A lead is researched and vetted by your sales team to qualify them as a potential fit with your organization. Discovery - A sales rep reaches out to a qualified lead to understand their needs and pain points and how they can be addressed. Meeting - A demo or overview of your proposed solution is given to a prospect to outline how it addresses their pain points, and aligns to their goals. Proposal - A proposal detailing the scope of work and associated costs is put together and sent to the prospect for review and revisions. Closed Won - The final proposal is reviewed and accepted by the prospect. Once this is defined, you will gain insight into how quickly leads move through through your pipeline, what factors influence their decision to move from one step to the next, and where any gaps may lie in your sales process. As prospects move through the steps outlined above, you will begin to gather data that will help you understand what your sales pipeline looks like. Two of the essential sales metrics that you will want to establish are the rates at which a prospect moves from one step to the next (better known as conversion rates) and the expected days to convert. The first number to calculate is the expected days to convert, as you will need this number to determine your conversion rates. Expected days to convert is merely how long you anticpate a lead remaining in a given step before they convert. We'll begin by measuring the average amount of time between when a lead enters and exits a given stage in your sales pipeline. The average is then increased by given factor to determine the amount of time in which we would expect a lead to have either moved on to the next stage or exit the sales process. For example if the average amount of time a lead spends in qualification before moving to discovery is 30 days, and we use a factor of 2, then our expected days to convert would be 60 days. Completed Qualification Leads (CQL) - The amount of leads that have completed the qualification process. 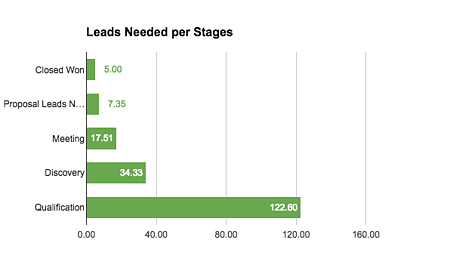 NOTE: This is not the same as total amount of leads in the qualification stage. Rather, it is the amount of leads that have been researched and vetted by your sales team and determined to be either qualified or unqualified. Old Qualification Leads (OQL) - The amount of leads remaining in the qualification stage after exceeding the expected days to convert timeline. This formula can then be applied to every step to determine the conversion rates across the entire sales pipeline. Once you have a better understanding of your sales pipeline you will be able to establish SMART goals in order to meet your growth targets. The best way to do this is by working backwards from your revenue goals. Assuming a company has a revenue goal of $100,000 per month, and their average deal size is $20,000, then it will take 5 closed won deals for them to hit their mark. We can then use the conversion rates (see above) to see how many prospects are needed in each of the preceding stages to reach that goal. That will provide insight into which areas of the pipeline are performing well, and where to allocate additional resources to improve performance. For example if the company described above had 100 leads in the qualification stage, then they would want to put efforts towards lead generation to build the top of their pipeline. Comparing conversation rates to industry benchmarks and internal goals will help you identify gaps and areas of opportunity within your sales process. Companies that have a qualification-to-discovery conversion rate below the industry benchmark should re-evaluate their qualification process. If there are a significant amount of leads that have stayed in the qualification step for too long, then there could be an issue of bandwidth in your sales team. One way to address this issue would be to leverage marketing and sales operations to automate and streamline the qualification process. On the other hand, if there are very few leads that have exceeded the expected days to convert, then the standards a lead must meet to be considered qualified might be too high. Lowering the standards would improve the Q-to-D conversion rate, however, it's important to keep in mind that this will have an impact on subsequent stages. 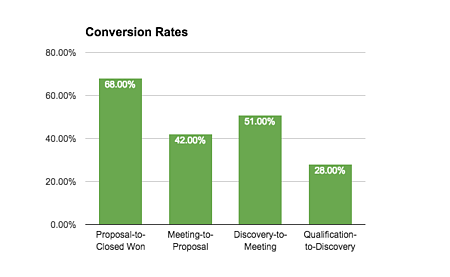 If too many leads start moving to the discovery step, then the discovery-to-meeting conversion rate could drop as a result. 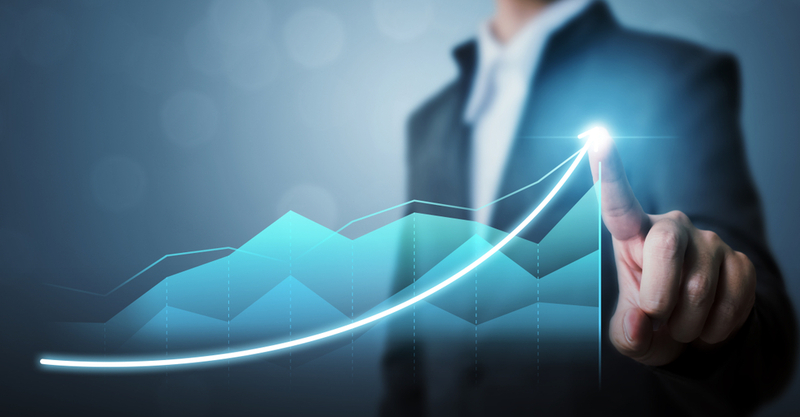 Sales pipeline management can be a painstaking process, but it's the best way to improve your sales process and exceed your revenue goals. Companies that take the steps outlined above you can look forward to the luxurious types of sales meetings we all dream of.